For inquiries and custom work contact us by email or skype. - ¿ What is a Forced Matrix ? The Forced Matrix is named because of its confined structure. Its key features are limited width and limited depth. Commission is paid on a level by level basis; by a percentage of sale price paid as each sale is made. Some time ago only paid members and affiliates where placed on the forced matrix, but our system can rollup free members (non paid members) commissions to paid all the configured and qualified levels. An affiliate will earn commissions based on his active membership, for example a silver member can earn 10 levels and a diamond member can earn 20 levels. The configuration is very flexible and can setup unlimited amount of membership types. We also help our customers to do matrix compression, this will require a manual work on very large matrices, we can teach your IT worker on how to process it, or you can hire us from time to time to achieve this job. The compression means to take out free or abandoned members from the matrix to make it more healthy, our compression method roll up active members to the immediate and available upline. This is recommened if your member database have 100,000 or more affiliates, we had clients with over 500 000 members on the matrix without problems on strong server with 16 cores,32GB of ram, SSD disks. 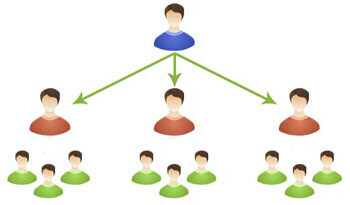 - ¿ What features have the MLM Central Core ? - ¿ What features have the Forced Matrix Edition ? 2. Unlimited members in the forced matrix, tested with over 5 million members. 7. Personal Volume (from own membership and direct referrals) available for bonuses. You can trust us your project, we have on our team a complete set of professionals, marketing, programming, content generation, management and server administration experts, you will not be disappointed.